How do you build the resilience of households that have no access to formal markets, limited access to productive farmland, whose livelihood is at the mercy of recurrent droughts, and who rely on the government’s safety net just to survive from season to season? The USAID/Feed the Future Livelihoods for Resilience Activity has introduced a technique called perma-gardening to households in the highlands of Ethiopia to help them maximize the productivity of a small amount of land. The participants in the project are part of the government’s Productive Safety Nets Project 4 (PSNP4) safety net program, which provides vital assistance to food insecure households in Ethiopia. PSNP4 addresses chronic food insecurity through the provision of transfers, public works that rehabilitate natural resources and address community needs, linkages to social services and livelihoods support. The Livelihoods for Resilience Activity is USAID’s contribution to the livelihoods component of the PSNP4 and is designed to complement and support implementation of livelihoods activities along three pathways: crops and livestock, off-farm and wage employment. The Project builds on the lessons learned from a predecessor project, Graduation with Resilience to Achieve Sustainable Development (GRAD). In the rural highlands of Ethiopia, land degradation and recurrent droughts combined with population growth have led poorer households to farm increasingly marginal land, making it difficult for them to feed their families year-round and increasing their dependence on safety nets. In this context, CARE and partners have introduced a technique called perma-gardening, which enables farmers to produce vegetables throughout the year using sustainable practices that improve soil fertility and conserve water. Using locally available materials such as ash, charcoal and grass to make compost, CARE and partners teach rural farmers perma-garden design, water management strategies and preparation of compost. A core principle is capturing rainwater that would otherwise be lost as run-off and "storing" it in the sub-soil. The technique involves deep digging plots and also digging four holes about 70 cm wide at the corner of each garden to collect roof water. Shimber shares that learning perma-gardening “...was very practical. I took it with my husband and my VESA members with the support of a perma-garden trainer and community facilitators. We learned how to prepare and care for a perma-garden on a small plot of land,” she says. As part of the training, Shimber’s family allocated a 16 sq. meter plot of land to the perma-garden. In the first round, Shimber planted four types of nutritious vegetables: chard, kale, carrot and beet root. According to Dinku Daniel, the Project’s perma-gardening training facilitator, any household with a small plot of land can create a perma-garden. Applying the technique conserves water for vegetable production and uses precious natural resources more efficiently. In one woreda, 480 households received training on perma-gardening, 130 of which started harvesting vegetables within months of applying the technique to their plots. 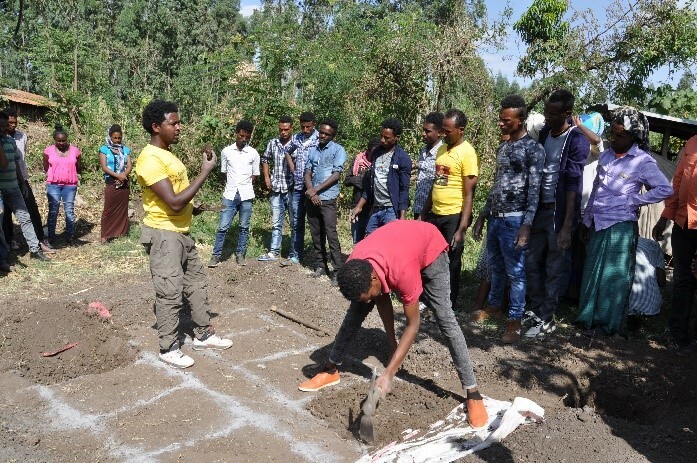 Due to the success and adoption of the technique among community members, community facilitators and extension promoters are cascading the training to thousands of households in 27 project woredas. For Shimber and her husband the most exciting thing about perma-gardening is the possibility of harvesting more from small plots of land throughout the year to sustain their food security. Perma-gardening was introduced to CARE by Peter Jensen of Terra Firma Intl. CARE Ethiopia, through the USAID funded Livelihoods for Resilience Activity piloted the perma-gardening technology as one way for households in the highlands of Ethiopia to maximize the productivity of a small amount of land.